Mexico's newest drug cartel, and certainly the most bizarre, is La Familia Michoacana, a violent but Christian fundamentalist narco-gang based in the torrid Tierra Caliente region of western Michoacan state. The group is infamous for methamphetamine smuggling, lopping off enemies' heads and limbs, and massacring police and soldiers. (Most recently, on June 14, a band of Familia gunmen ambushed a federal police convoy in Michoacan, killing 12.) Yet La Familia's leader, Nazario Moreno  aka El Mas Loco, or The Craziest One  has written his own bible, and his 1,500 minions hold prayer meetings before doing their grisly work. La Familia, which has started to expand beyond Michoacan, poses more than theological problems for Mexican President Felipe Calderon. His 3��year-long military offensive against drug traffickers, a period that has seen 23,000 gangland-style murders in Mexico, looks increasingly on the ropes. And amidst it all, investigators tell TIME, La Familia is establishing a troubling new narco-business model: It doesn't merely buy off officials, it puts its own candidates in power. "Other cartels just pay off the political structure in order to be able to do their business," says a Michoacan investigator, who estimates the group controls 83 of the state's 113 municipal governments. "La Familia is making itself the political structure." U.S. law may have inadvertently aided La Familia's sudden surge. In 2005, Congress curbed over-the-counter sale of pseudoephedrine, methamphetamine's main ingredient, causing the number of U.S. meth labs to plummet. But La Familia also controls smuggling at Michoacan's main port, where massive amounts of illicit pseudoephedrine regularly arrive from Asia. As a result, the cartel could fill the void in the U.S. market for meth, which is the most popular illegal drug in the West and Midwest. La Familia now exports about 100 tons of meth to the U.S. each year, with a street value of as much as $10 billion. The Obama Administration has designated La Familia "a significant foreign narcotics trafficker," and Attorney General Eric Holder calls its "depravity" among the worst of Mexico's cartels. Last fall, a Drug Enforcement Administration-led operation collared more than 300 Familia operatives in U.S. cities. But the war against these criminal Christian soldiers may have just begun. 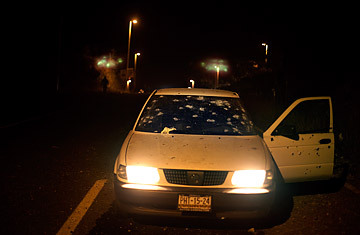 See more pictures of Mexico's drug wars.